UPDATE 11-11-2014: CW Cindi Fowler (D-14) has become a co-sponsor of the ordinance that would raise the minimum wage in Louisville. became the second US city to raise its minimum wage to $15 per hour. 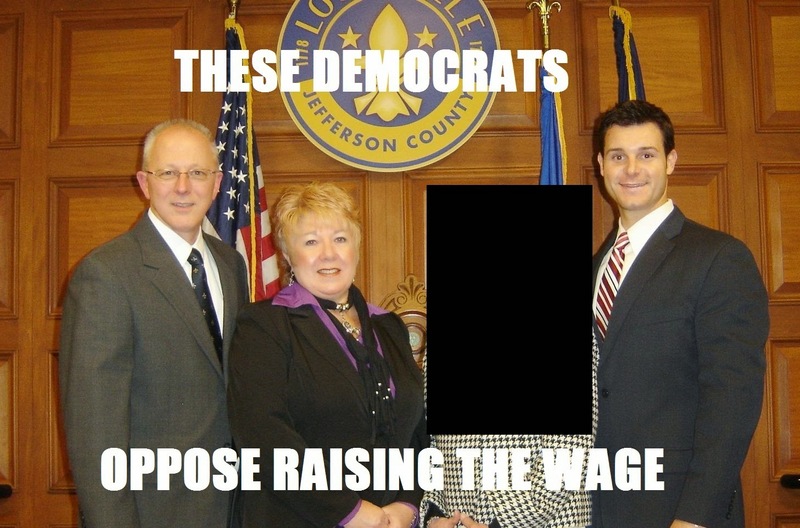 The shamed councilmembers are, from left in the image, Rick Blackwell (District 12), Vicky Aubrey Welch (District 13), Cindi Fowler (District 14), and David Yates (District 25). All four of these Council members are Democrats who were elected after pledging to Louisville labor leaders to support working people. Kentucky Jobs with Justice has a webpage set up just to let Metro Council members where you stand on the proposal to raise the minimum wage. The next Labor and Economic Development Committee public meeting will be Monday, November 10, 2014, at 6:00 PM. The meeting will be held in Metro Council chambers, 601 W. Jefferson St. Show up and let your Metro Council know it's time to #raisethewage! The Southwest Community Festival is one of the biggest community events in Louisville celebrating and showcasing Southwest’s people, businesses, and culture. The Southwest Community Festival draws over 20,000 people, each year, to this one day event. The festival will be held at Sun Valley Park on Saturday, October 11, 2014 from 9:00 am to 5:00 pm at 6505 Bethany Lane in Valley Station. New this year there will be a “Concert in the Park”. The concert will be Friday, October 3, 2014 from 6:00 pm to 10:00 pm. Several events which lead up to the festival include: Concert in the Park on October 3, 2014 from 6:00 pm to 10:00 pm enjoy live music at Sun Valley Park, 6505 Bethany Lane. Please remember to bring your own chair to the concert. On October 9, 2014 starting at 6:00 pm, Valley High School, 10200 Dixie Hwy, will host a community Spelling Bee for area elementary school children; The 29th Southwest Community Festival kicks off in the morning with a pancake breakfast at Sun Valley Community Center from 8 a.m. to 11 a.m. The pancake breakfast will also include sausage biscuits and biscuits/gravy and the proceeds go to Southwest Community Ministries. FREE festival events include: Hundreds of booths to browse showcasing the Southwest; A car and motorcycle show from River City Street Rods, Inc.; Kids City with free games and inflatable’s sponsored by Valley View Church; arts, crafts, food booths; Teen City, Toddler Town, Men’s tent, and a Senior Tent with bingo and drawings. Be a part of the festival! Applications for booths and sponsorships can be downloaded at www.southwestfestival.org or call 502-403-6188. Friday, October 3, 2014, 6 p.m. to 10 p.m.
Bring your own chairs and blankets! The weather is just right for outdoor activities, and the regular schedule of exciting events is once again in place. Grab some friends and get out for some local entertainment this weekend and all through the month of October. - 35th Annual Louisville Street Rods car show at Iroquois Park. Saturday, September 28 and Sunday, September 29, 2013 from 8am until 5pm Saturday. 8am to 4pm Sunday. - District 12 residents know that one Saturday a month they have a chance to talk one on one with Councilman Rick Blackwell. The next “Coffee with your Councilman” is set for Saturday, October 5th. This event will take place at Sister Beans Coffeehouse, 5225 New Cut Road beginning at 10:00am. There is no formal program and no need to sign up, just stop by and talk with the Councilman about any issue or concern you may have for the district. For more information about the October “Coffee with your Councilman”, contact Councilman Blackwell’s office at 574-1112. - A free canoeing event will be held October 5th at Riverview Park (Greenwood Boat Dock). Registration is required, but there is no fee or charge to participate. Come enjoy this awesome new event in Southwest Louisville. Click HERE for the event flyer and more information! Have an event you'd like to see here? Contact us and we will post it for free. Thanks for reading the Valley report. Councilwoman Vicki Aubrey Welch will bring MetroSafe to District 13 at her next “Coffee with your Councilwoman” as the series returns on Saturday, August 17th. Debbie Fox, Director of Metro Safe will be Councilwoman Welch’s special guest for the event. A District 13 resident herself, Fox will talk about MetroSafe’s services and how the public can play a vital role in safeguarding the community. “Coffee with your Councilwoman” is an informal gathering open to the public and offers an opportunity to discuss community issues with Councilwoman Welch in a relaxed setting at First String Family Grill, located at 5921 New Cut Road beginning at 9:00am. 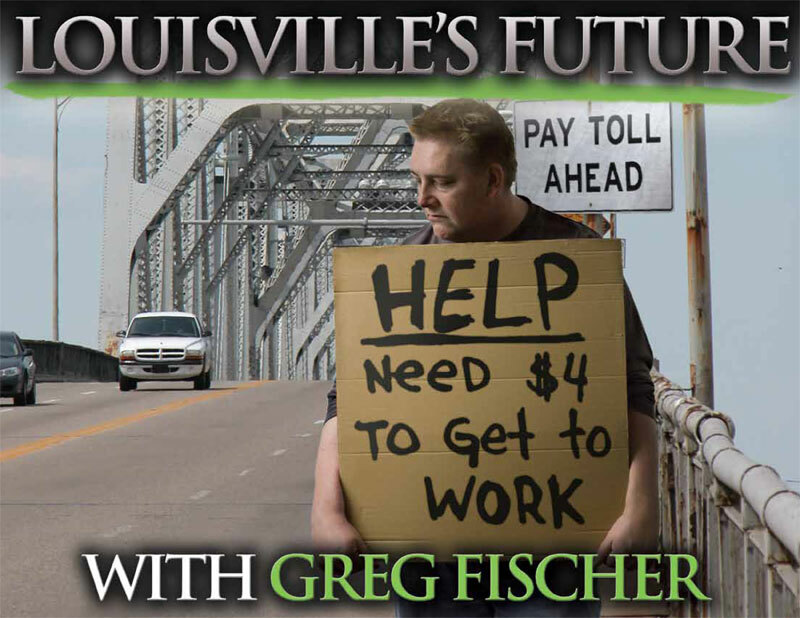 Do you have a question about Louisville Metro Government? How about a concern for your neighborhood? Is there an important issue facing our community you’d like to share? This is your chance to ask those questions over a free cup of coffee. No appointment is needed. For more information about the August “Coffee with your Councilwoman”, contact Councilwoman Welch’s office at 574-1113. 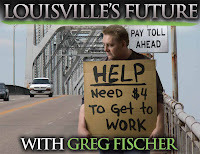 Members of the Democratic Caucus of the Louisville Metro Council are encouraging anyone who is concerned about tolls on the new Ohio River Bridges to voice their concerns or opinions at two open house meetings early next week. The Kentucky Transportation Cabinet and the Indiana Department of Transpiration currently have a draft assessment of the impact of tolls for the project. The Open House meetings are being held to gauge more public input. On Sunday, several members of the Democratic Caucus held a news conference encouraging public participation. “Right now all attention is focused on the beginning of construction but it is important to remember when these bridges are completed, tolls will become a reality,” said Councilman Rick Blackwell (D-12). “Many people are still struggling in this economy and for some these proposed tolls are going to be a burden. That’s why now is the time to voice how you will be impacted if tolls are placed on these new bridges,” says Councilwoman Attica Scott (D-1). · Monday, July 22, from 4 to 7 p.m. EDT at the Holiday Inn Clarksville, 505 Marriott Dr., Clarksville, Ind. · Tuesday, July 23, from 4 to 7 p.m. EDT at the Kentucky Center for African American Heritage, 1701 W. Muhammad Ali Blvd., Louisville, Ky.
· July 22 meeting – Take TARC to the Spring Street stops at 14th or 15th streets in Jeffersonville, Ind. Shuttle to Holiday Inn Clarksville will be provided at that point. · July 23 meeting – Take TARC to the Muhammad Ali & 17th Street stop. fun, and a barge load of fireworks on the Ohio River. The Riverview Park Independence Festival will run from 5:00pm to 11:00pm on Saturday, June 29th. It is a free event. Joining Blackwell and Fowler as Metro Council sponsors are Vicki Aubrey Welch (D-13) and David Yates (D-25). Kids’ activities include appearances by Louisville League of Mascots, “Make your Own Slime” and “Make your Own Cotton Candy” provided by Mad Science of Kentucky; and the wonderful Riverview Splash Park! Fantastic Fireworks Show on the Ohio River at 10:30 pm! Limited parking is available at the park. Additional parking will be available at PRP High School (5901 Greenwood Road) and TARC will be providing a trolley shuttle service for attendees.